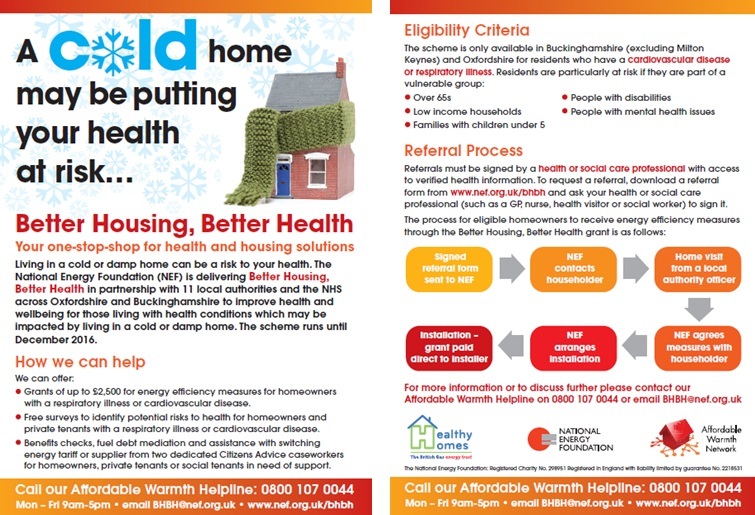 The Oxfordshire Affordable Warmth Network is a longstanding service working to reduce the number of people in fuel poverty; and so improve health & wellbeing. It is coordinated by National Energy Foundation (registered charity number: 298951), but involves many other organisations across Oxfordshire, with a cross-referral mechanism in place to maximise the benefit to residents of each organisation’s field of expertise. This service is available to any household within Oxfordshire County. There are no eligibility criteria for residents to access this service, and we can assist all housing tenures (private or social renters and owner occupiers). It encourages residents to look out for their neighbours, and those more vulnerable than themselves, particularly when the temperature drops, and risk of adverse health effects are increased. Financial assistance for home efficiency improvements (such as loft or wall insulation, replacement high-efficiency boiler or heating control upgrades etc) may come from ECO grants, energy supplier trust funds, benevolent trusts, flexible home improvement loans, and ‘fuel poverty’ grants held by us on behalf of local authorities in Oxfordshire, and specific project elements such as 'Better Housing, Better Health', depending on eligibility and available funding. We will work with you to find funding to help, even if this comes from a mix of sources as above. We are currently able to fully-fund replacement boilers, virgin loft and cavity wall insulation in some cases, so please call our helpline for a quick eligibility check: 0800 107 0044. A free thermometer card (to enable you to check that adequate temperatures are being reached to help stay healthy) and/or a Plugster (thin plastic handle to assist with unplugging electrical items) are available upon request via 0800 107 0044. Give our friendly staff a call Monday to Friday, 9am to 5pm, and find out how we can help save you money on your household energy bills, and keep you cosy and warm in the colder weather... The team look forward to hearing from you! There is no cost to this service, and our aim is to save you money by making your home more energy-efficient, cutting energy bills and advising you on easy ways to cut bills through behaviour change and potentially switching energy tariff. We have a cross-referral mechanism in place with other key organisations which makes the process of accessing other helpful services as easy as possible. Finally, we also have access to funds that are for local projects (such as 'Better Housing, Better Health'), and therefore not available elsewhere. These may only be accessed through the Affordable Warmth Helpline.